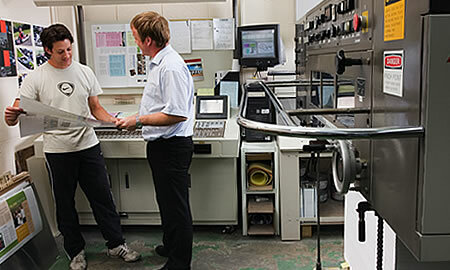 Adams Printers have a wide range of presses, finishing equipment and modern technology, enabling us to produce a variety of jobs efficiently and cost-effectively. We have 5 Litho Presses ranging from a simple 1 colour SRA3 up to a 5 colour B2 with Cip3 Ink-Key Pre-setting. All of our presses run alcohol-free which is environmentally friendly, cutting the release of VOC's to a minimum. Our in-house finishing services include Guillotine Trimming, Folding, Collating, Gather Stitch Trim, Booklet Making, Laminating, Numbering & Perforating.